Again, it’s been a long time since my last foodie post! 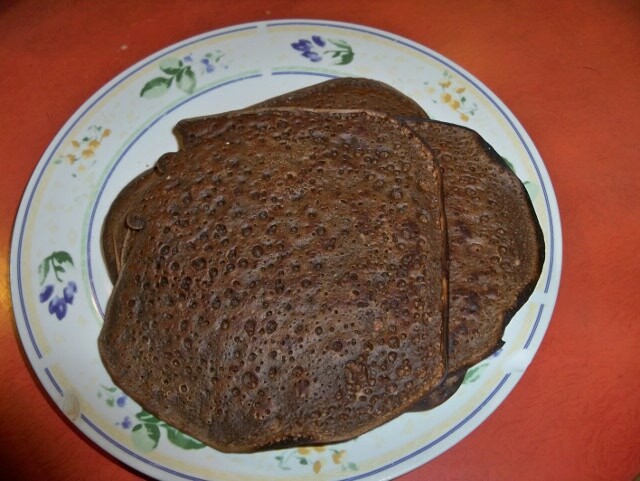 This time I am sharing with you one of those super simple and super effective recipes – “dark” crêpes. I will give you a unit recipe, which yields 6 thin crepes – just scale up as needed! Skipping the carob makes normal “white” crêpes, too. Marmalade, honey, whipped cream, dulce de leche…. Beat the egg lightly in a bowl, add the milk, and mix well. Add the flour, sugar and carob flour, mixing thoroughly. The consistency will be almost liquid. Heat the pan with a little fat, and pour a ladle-full into the pan. Immediately move the pan so the batter covers the pan thinly. Turn it as soon as it looks dry up to the centre, and cook for just a minute or so on the other side. Remove from tha pan and repeat until all the batter is done. En un bols, batir ligeramente el huevo y la leche. Agregar los ingredientes secos y mezclar muy bien. La consitencia será casi líquida. Calentar la panquequera engrasada, y con un cucharón verter la masa sobre ella. Inmediatamente, mover la panquequera para desparramar la masa finamente. Cocinar hasta que se vea seco en todas partes, y en ese momento darlo vuelta. Cocinar del otro lado apenas alrededor de un minuto, sacar de la panquequera y repetir hasta que no quede más masa. 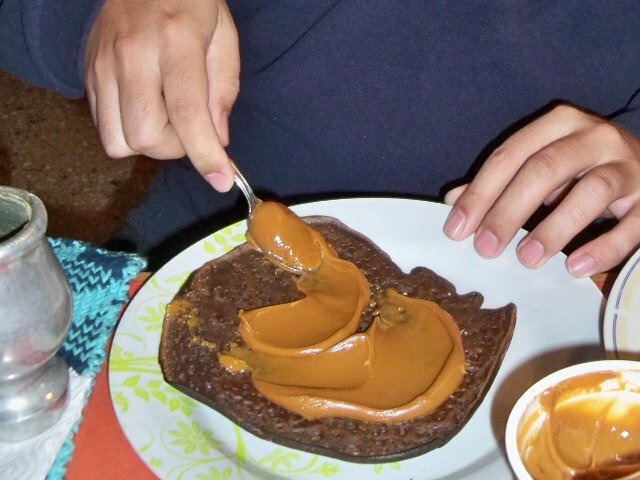 To eat: spread with honey, marmalade, whipped cream, or better still, dulce de leche and roll. Enjoy! Para comerlos: untar con miel, mermelada, crema batida o, lo mejor de todo: dulce de leche, enrollar y ¡A disfrutar! I'm soyloquesoy at ravelry too! Esta obra está licenciada bajo una Licencia Creative Commons Attribution-NonCommercial-ShareAlike 3.0 Unported . Enter your email address to subscribe to this blog and receive notifications of new posts by email. ~ Escribe una dirección donde recibir mensajes cuando haya nuevas publicaciones.